Thanks to generous IAPS seed-corn funding, my study leave got off to a brilliant start in February with a successful research trip to Sapa in northern Vietnam. The purpose of the trip was to generate pilot data on ethnic tourism, a niche market that is growing rapidly in Vietnam and other parts of Southeast Asia. Much of my research to date has been concerned with the racialisation of local people in tourism advertising, and this current project is interested in how racialised representations, or ‘tropes’ of ethnicity and indigeneity are being drawn upon by tourists. Ethnic tourism, also sometimes called ‘tribal’ tourism, involves remote villages being visited by coach parties of tourists who are encouraged to photograph ‘tribal’ people, purchase ‘traditional’ artefacts and ‘collect memories’. The underlying principal of ethnic tourism, which is to seek out and gaze upon ‘Othered’ peoples, is not new; there are strong colonial echoes when organised ethnic tours in former colonies in the developing world are marketed though heavily Orientalist reproductions of the Global South. Global and domestic tour agents are beginning to capitalise on tourists’ desire to visit ever more remote areas in search of ‘authentic’ experiences and adventures, and this often involves gazing upon indigenous peoples. Such ‘tourism of difference’ is growing in developing countries in Asia, South America and Africa, but Vietnam is especially interesting, and potentially vulnerable, because it is developing its tourism industry in the aftermath of a deeply embedded post-colonial war, whose violence and suffering are themselves now commodified for tourism. Vietnam’s tourism grows in a context of orientalist commodification of cultures, history and the performative presence of ‘Others’. There are unexplored layers of complexity to the cosmopolitan idea of what John Urry (1997) has called a ‘right to tour’, because not only does such cosmopolitanism exclude those outside of its economic advantages, but indeed relies upon that exclusion for its commodifying power. Its destroyed post-war infrastructure, poisoned natural environments, severe displacement and extreme poverty make Vietnam and neighbouring countries especially vulnerable to laissez-faire, neo-liberal development policies (or lack of), and this research is concerned with the implications of that fact for indigenous people, whose indigeneity is being understood and reproduced as being outside of ‘time’ and who are therefore potentially denied access to benefits of tourism development. Tropes of primitivism, backwardness and difference prevail in the depictions of indigenous people in ethnic tourism promotion. It is argued that these representations are carried through into embodied trips to ‘faraway’ lands and, in many contexts in the developing world, tourists’ discourses, behaviour, consumption, photography and so on reinforce a narrative mastery in which tourists ‘fix meaning, encapsulate and control the other, to stop motion and time, to exert power’ (Bruner 2005:195), meaning that tourists are able to ‘bring back a disembodied, decontextualized, sanitized, hypothetical Other, one they can possess and control through the stories they tell about how the souvenirs were purchased and the photographs taken’ (Bruner 2005:194). These arguments are persuasive yet remain theoretical; no research exists to date that traces narratives of desire from conceptualisation through to embodied travel and considerations of the future of the communities. How are culture and history commodified in tourism to Vietnam? How do these notions shape the expectations and conceptions of tourists? Do tourists seek out versions of ethnicity to which they have been exposed in marketing material? How and why do they do this? How are indigenous people, ‘captured’ and consumed by tourists and what does this imply for their welfare and rights? The IAPS-funded study has been very revealing and is being worked into a journal article and large ESRC funding bid. Findings suggest that ethnic tourism has had a marginalising effect on minority ethnic groups, who are becoming excluded from the market for behaviour that is not deemed ‘authentic’ (e.g. using mobile telephones and other technological devices, smoking cigarettes, ‘hard – selling’ goods and so on). I conducted ten qualitative interviews with tourists on ‘ethnic tours’ and collected/recorded photographs, souvenirs and other mementos. This pilot data shows that tourists are drawing on a narrow range of ethnic/racial tropes throughout their participation in ethnic tourism and are carrying forward their pre-conceptions into tourism environments. The data suggest that the ways in which ethnicity is packaged for tourists and the ways that tourists ‘authenticate’ ethnicity shapes their desires, which then shape their behaviour and interactions with locals. 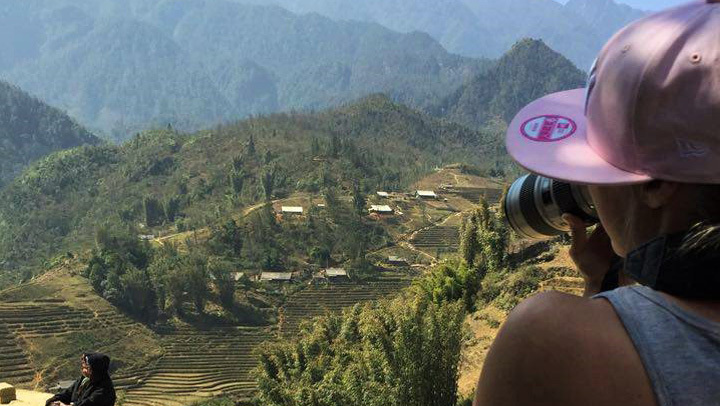 The impacts of ethnic tourism on Sapa are considerable and troubling, with the whims and desires of tourists steering tourism organisation, including the surveillance and controlling of ethnic minority groups in and around the town. The study illustrates the need for further examination of the market for ‘Otherness’ in a broader geographical context in Southeast Asia, and for policy recommendations and outreach to the full scope of public, private and third sector stakeholders in the ethnic tourism industry. Dr Esther Bott is a Lecturer in the School of Sociology and Social Policy at the University of Nottingham. Image credit: Author’s own.